Brass Tubing | Copper Tubing Fittings | B & L Brassworks Inc.
We use only the finest quality brass tubing and stainless steel tubing. Our 2 inch brass tubing is a standard for bar foot rails and glass railings, while 1 1/2 inch tubing is used in handrail applications. Specialty brass tubing such as square brass tube, slotted brass tube, spiral brass tube, reeded brass tube and ornamental brass tube are available. A variety of wall thicknesses are available for use with our foot rail and handrail fittings. If your application requires bending, we have the right tube for you. Our brass is hand polished to a mirror finish and can also be provided in chrome, copper, brushed nickel, satin and antique finishes. 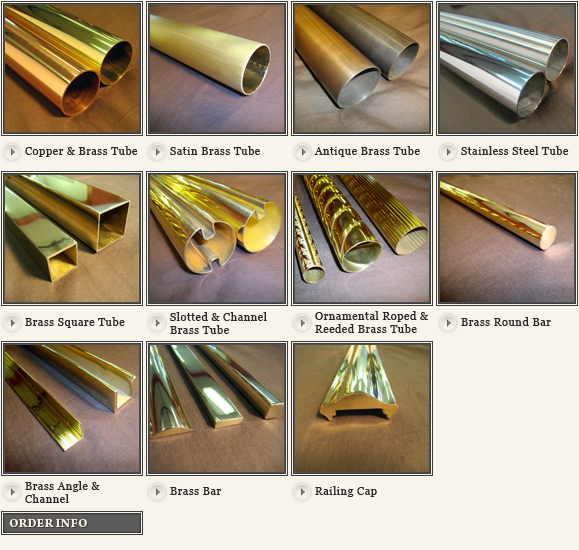 We stock a wide variety of brass channel, brass flat bar, brass round bar and brass angle.